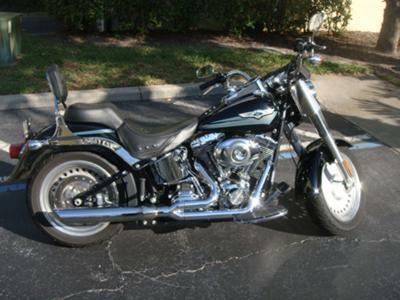 I have my 2008 Harley Davidson FAT BOY for sale that's located in Maitland Florida. It's an FLSTF model that's been garage kept and is very clean. It has an aftermarket exhaust system, a passenger backrest and all 98 cubic inches of power runs perfectly and looks cool! The bike is still under factory warranty, which is as we all know a big deal. I'f you're a biker that knows a good used Harley motorcycle for sale when he sees it, leave your questions and contact information in the space below provided by Strike Lightning Used Motorcycles for Sale and the owner, Shane, will get back with you as soon as possible. Strike Lightning would also encourage bikers to submit a review of the 2008 Harley Davidson Fatboy for Sale to help potential buyers make informed decisions and to benefit the biker community as a whole.